Banbridge Rangers took Dungannon Swifts Reserves to extra-time in the Bob Radcliffe Cup but ultimately lost 4-3. Goals from Colin Cunningham, Neil Clydesdale and Colin Cousins were not enough to see the Gers triumph in this seven goal thriller. Rangers were ahead at half-time but needed a stoppage time goal to take the tie into extra-time after Dungnanon Swifts had scored twice. Colin Cunningham fired home from a tight angle after another rapier like pass from a Chambers free kick to make the score 1-0 to Banbridge Rangers after 28 minutes. Dungannon equalised on the 50th minute with a somewhat disputed goal. There was some debate whether it crossed the line after a great save by Blevins. 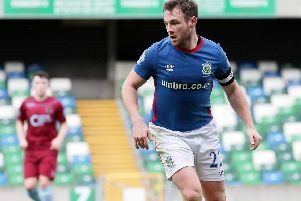 Dungannon must have thought they had the game wrapped up after they scored in the 91st minute but a thunderbolt from Neil Clydesdale three minutes later took the tie into extra-time. A speculative Dungannon effort form 40 yards found its way into the net in the 98th minute to put them 3-2 up. The next goal was going to be crucial for the outcome of the match and Dungannon grabbed it 107th minute following a swift counter attack and a well taken finish. Colin Cousins pulled one back for the Gers a minute later but it proved to be little more than a consolation.